What can you guys tell me about D2 wide receiver Jeff Janis? Obviously his level of competition is a red flag, but he definitely has the production and appears to have the measurables to garner some attention from NFL scouts. Can anyone provide any insight on him as an NFL prospect? He's been tested in the 4.3s in the 40 by some scouts. He's very reminiscent of Jordy Nelson and has that type of upside. Big, fast, sharp cuts, makes nice adjustments, usually good hands. Could end up as high as a 4th round pick and if he goes undrafted will definitely be a priority UDFA. Wouldn't surprise me at all if he made a team's final 53 in his rookie year regardless of draft position. Obviously competition is somewhat of a concern since it isnt D-1, but as far as small schools go, the GLIAC is probably the toughest conference in the nation (at least at the D-2 level) and routinely puts guys in the NFL. Dont know much about this kid specifically though. Yeah, when I did a little bit of digging around on Janis I found the info on possibly running a sub 4.4 in the 40 yard dash. He definitely has an intriguing physical skill set that is for sure. He seems like a potential developmental prospect and I am going to try and keep my eye out for reports on him as we progress toward offseason workouts. Good feedback. As you mentioned, the level of competition will be something teams consider, but the positive for Janis is that he has dominated at that level. I think teams have much bigger concerns when they evaluate prospects at lower levels with a good to elite physical skill set that don't necessarily stand-out from the competition or don't separate themselves as much as you would expect from a prospect with their skill set vs. lower competition. I have had the chance to watch him and Charles Johnson live. It is no contest Johnson was the far superior talent. I am not saying Janis cannot make it just that look for him to be a 7th or UDFA bc that is where Johnson went. Great athlete. Even though he is D-2, like 1king said he plays in one of the best D-2 divisions. He will likely be a 7th-UDFA type guy. He'll likely be on the practice squad for a year or two, then he'll likely break onto the roster by finding a spot on special teams and then eventually he might get a chance to contribute if a guy goes down to injury. His production is off the charts doe. Seems to be well regarded by pro scouts, too. He cracked Gil Brandt's top 100 list. 8 catches, 240 yards, 4 td's. He's destroying his competition. Really hope he recieves a senior bowl invite. 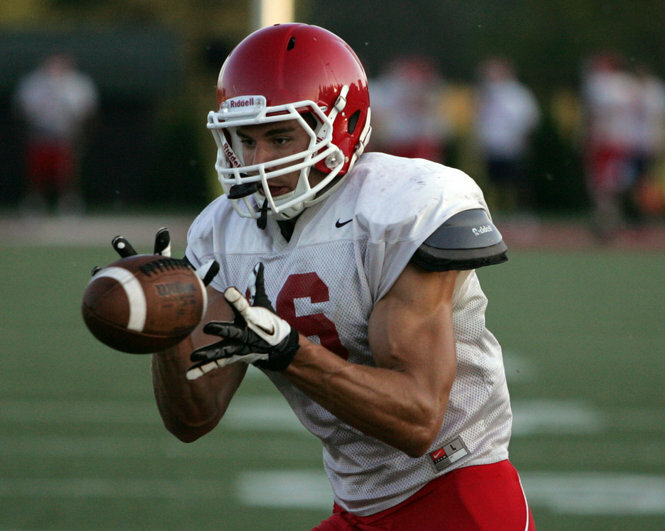 Jeff Janis accepts the invitation to play in the 2014 Senior Bowl. Janis officially received an invitation to play in the 2014 Senior Bowl Thursday. This year's game is on Saturday, January 25th at Ladd-Peebles Stadium in Mobile, Alabama, and will be televised on the NFL Network. "It's such a great honor," Janis said. "My agent called me two days ago, and asked do you like eating fried fish because that's what they serve down in Mobile. I knew it was a possibility, but it wasn't something I was counting on." "I think this shows how good of a prospect he is," Collins said. "The Senior Bowl committee picks players based on NFL scout recommendations. There's no politics, no nominations from coaches or agents. The players picked are just the ones that scouts want to evaluate." 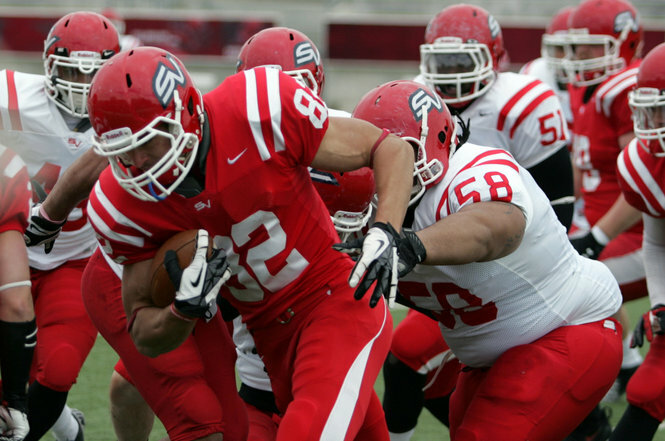 The 6-foot-3, 218-pounder is only the second player in SVSU history to be invited to play in the game, and the fourth player out of the GLIAC. I'm excited to watch him. He'll probably be the fastest white guy there. Are you gonna post that in every thread about a player you've never heard of? He's a D-2 player where do you expect him to be drafted? Don't hate me for being realistic.